In a city full of eateries striving to come across as authentically New York, it takes a Japanese-inspired London import to create a space that feels truly international. With locations in far-flung Dubai, Bangkok and Miami, Zuma’s globe-trotting influences play out in both appearance and menu at this New York outpost, which opened in 2015. 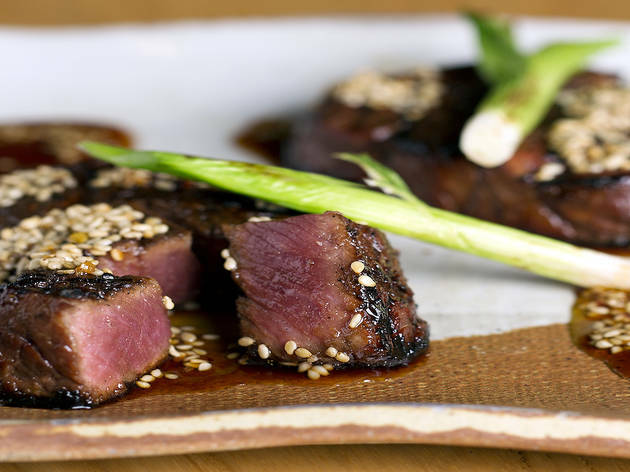 The brainchild of German-born chef Rainer Becker, the 100-seat, iron-and-leather–clad concept centers on the informal Japanese style of izakaya dining, which typically involves shareable small plates along with a selection of sake. And while the markings of an upscale izakaya abound—there’s a sushi counter, 80-bottle sake bar and robata grill—, informal would also be the best way to characterize the restaurant’s treatment of its principal cuisine. Offered a la carte or in a choice of chef’s omakase ($58 classic, $98 signature, $158 premium), the menu comprises such worldly offerings as prawn-and-cod dumplings, pork belly with yuzu mustard miso and an oven-roasted, corn-fed chicken roasted on cedar wood. On a recent night, the mid-range signature omakase opened with a steamed baby spinach lathered in a pleasantly sweet, almost peanut-buttery sesame dressing, before delving into a mixed parade of raw and robata offerings—of these, the standout was a simple yet instantly addictive fried softshell crab dipped in mizuna (Japanese mustard) and wasabi mayo, while crowd-pleasing seabass sashimi (yuzu, truffle salmon roe) proved likewise a success. Rounds of assorted sushi and sashimi did not fare quite as well: a serrano-whispered spicy yellowtail roll with avocado overpowered its fish and a dry tuna-salmon tartar was left untouched, having arrived flavorless and mushy. These missteps were thankfully forgotten upon the arrival of hot dishes, including a tempura “popcorn” that wrapped sweet kernels in a light batter, plump chunks of roasted lobster in a shiso-ponzu butter and a spicy beef tenderloin slicked with a delightful yet subtle blend of sesame, red chili and sweet soy. Set to the beat of a bass-driven playlist that flipped between electronic and top 40’s, the experience is easily compared to those of such similar “upscale Japanese fusion” players in NYC. And while Zuma does tout a slight edge in the kitchen, its the understated decor and relaxed atmosphere that kicks it one notch above its competitors: absent are the gaudy blue lights of Hakkasan and the excessive wall hangings of Nobu—here, elevators are encased in glass, granite slabs panel the space and exposed wood beams provide structure for the high ceilings. It’s distinctly modern, yet warmly rustic, a testament to Zuma’s ability to appease the sensibilities of its far-reaching global audience, even if that means playing it safe. I came with a party of 8 for our company holiday party and the experience was great. It was a Thursday early evening so it wasn't overly crowded but a good atmosphere. We started in the upstairs bar while waiting for the full party to arrive and they had a great selection of cocktails and signature drinks to choose from. Once seated our table in view of the sushi bar and the kitchen, our server offered to provide us with the chef's specials and just keep food coming. I'm usually pretty skeptical when restaurants offer this as I feel they're going to take advantage of it and bring out the most expensive dishes and wouldn't be able to accommodate some of our groups individual tastes, but there was a good mix of land, sea, and veggie dishes - all of it was delicious. The staff was super engaging and had multiple people checking in on us and telling us about the dishes and the preparation. It was a higher end experience, but we were prepared for it and it met our expectations and then some. We'll definitely be back again. I've waited a while to review Zuma New York because I work in the area and have come a few times for different occasions- lunch, weekday dinner, weekend dinner, and have ordered both a la carte and omakase. 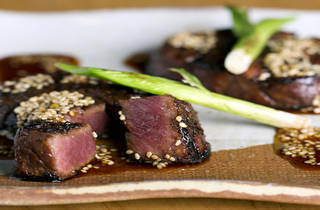 The food is consistently outstanding, much like the other Zuma locations. I have dreams about the fried langoustines with chili dashi. That is seriously one of the best things I've eaten in my life! I've recently eaten at some of the other big names in modern Japanese here in Manhattan, and Zuma is way better. I get some of the critiques about the service, but it's recently been great, IMO, and the bottom line is that I always leave Zuma in a great mood. That's what it's all about, right? The food was fantastic and felt the wait staff was very knowledgable of the menu. When we asked what would be a good wine pairing with our dishes, they gave us great recommendation and wasn't the most expensive bottle on the menu. I would for sure recommend going to this restaurant. Zuma consistently hits its mark. The sashimi was particularly good. I understand that is a swanky, popular place and don't get me wrong, it is a beautiful space. However, they have some nerve charging $36 for a GLASS of rose. Either that is a typo on the drink menu or that is just plain obnoxious. You're better off ordering a bottle. Food was good, but very small portions. Regardless, we spent a lot of money & walked out hungry. Our tab was about $600 for 6 people. Lobster was a bit under cooked. Really wish we had more portions for yellow tail & shiitake mushrooms. Mediocre, over-salted & overcooked. NEVER again!! Obnoxious staff. Would give it a zero if I could. Written to Zuma without a response: Waited 2 1/2 hours for a table as we were repeatedly and rudely told that it was ready only to be told to wait another half hour again and again even though the place was half empty with not a soul at the bar or waiting for a table on a Saturday night. At one point the hostess just pointed to the stairs and said to go up there without even escorting us only to find the upstairs host with no knowledge of us. Finally left hungry. The employees all have contempt for the patrons. Everyone is rude: the hostesses, the bartenders, the managers. After 2 1/2 hours of waiting (and drinking at both bars with my party) I finally got a little upset and raised my voice just a touch. At that point I could see the smirk on the hostess' face as she knew she had her excuse. She threatened to throw me out. I asked for the general manager, apologized for raising my voice, and explained the whole story. The hostess (who claimed she was an asst mgr left in a huff.) The general mgr went after her. On his return he told me that he could not seat me and my party that night because, and I quote, "I have to keep my people happy". In other words, he was more concerned about the hostess and her power trip than the customer. I'm a calm 57 year old businessman and lifelong New Yorker. It was actually my birthday Sat night and I was with friends. I've never been treated so horribly in any restaurant in my entire life and I've never written a letter to a restaurant before this one. I've read that the food is very good at Zuma New York but the front desk is terrible. It's true. You ought to do something.